When the summer heats up so does the grill. While burgers are often a staple for the pit, these portabella burgers are the perfect substitute when you want something new and different. 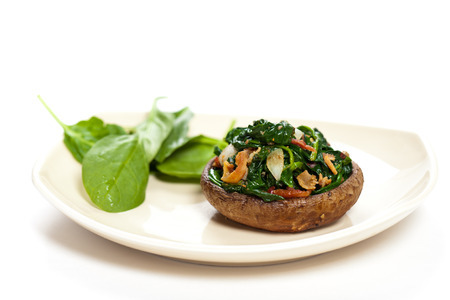 These mouthwatering ‘shrooms have a meaty texture and are fine between a (gluten-free) bun, but my favorite way to eat them is stuffed with grilled onions, bell peppers, with spinach folded in. However you decide to eat them, one thing’s is certain…you will enjoy them. Rinse and remove the stems of the mushrooms, then pat dry. Place the mushroom caps, smooth side down, in a shallow dish. In a small bowl, whisk together vinegar, oil, Tamari sauce, basil, oregano, garlic, and pepper. Pour over the mushrooms. Let stand at room temperature for at least 30 minutes. Preheat grill for medium-high heat. Brush the grill with oil. Pour any excess marinade out of the mushroom caps and reserve. Place mushrooms on the grill smooth side up, reserving marinade for basting. Grill for 5 to 8 minutes on each side, or until tender. Brush with marinade frequently.